Posting today with a happy heart, and trying to think of something interesting to say to my dear visitors! How've you been, anyway? My own state of intense well-being is due to several events, but more than anything else, we [well, Charlie, actually] found my missing stuff!, and now I can do a little mail-order jobby on Monday morn. Amazing how gray the moments become when one's eldermind leaves one without any -- ANY -- short-term memory. And that's the story from the Urban Prairie this sunny afternoon. What do you think of my HobbyLobbyables? Yes, there is such a word, but that explanation will keep for another day. Mostly I wanted you to see something perty that I found in the 80-per-cent-off aisle at my second-favorite store a few years back, a find that brought tears to my eyes and a real gasp along with them. I just didn't expect it. Then later on in the year, dearest friend Lynn Tolles (who takes the in-house photos with her amazing Polaroid digicam with the 8.0 megapixels) stopped in Oklahoma City and brought back the postcard with the gorgeous watercolor painting of my other two favorite famous people in the history of famous people who aren't related to The LORD. (Oh, boy.) And later on that same year, while wondering what to do with the blessed postcard. . . well, that gaudy cloth-covered frame is its permanent home now, and it's the first thing I see when my eyes finally open enuf to let light in every morning. The box is exactly the right size for holding 4-by-6-inch photographs, and the 6-&-5/8-inch-square clock has a dysfunctional easel which occasionally goes "plop!" down on my big work table, but I loves it just the same. Everything was machine-assembled (with a lot of neat glue work for the linings & cloth hinges) in India out of seven different brightly-colored cottons of questionable quality, with plastic blouse buttons (sewn on! ), shiny rayon-thread machine embroidery on seams and patches, 3-mm round sequins in several colors, clear 2-mm bugles, and a wavy (instead of pointy) lime-green rickrack used for "stems." Add some low-loft poly batting for padding. I'm thinkin', nice ideas for Holiday gifts! Maybe in a softer palette, hm-mmm? Of course, it'd be pretty hard to make the clock for only $3.20 or the box for $4.00. Gosh, I love a great sale, don't you? Miss Willa sent me a link to a store with an online presence that also made me grin a lot Saturday afternoon: CLOTILDE's! 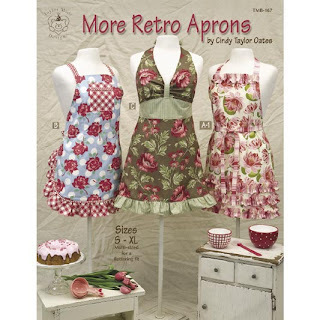 Visit her wonderful site at www.clotilde.com/, and for something very cool, check out some of her best apron patterns at www.clotilde.com/pages/catspreads/2832/catalogspread07.html. I have two commercial antique-quilts merchants to introduce to some of my readers who may not be acquainted with them yet. First, Cindy Rennels is a familiar face at all of the largest and most important sane-quilt conferences and expositions. But she has some of the nicest crazyquilts, too, from time to time. Try her 'site at http://www.cindysantiquequilts.com/ , and check her left-side navigation bar for any category of quilt that interests you. Not to be forgotten is another wonderful e-store at http://www.rockymountainquilts.com/ , which is actually in Maine, I believe. Betsy Telford's fine 'site gives us perfectly-taken pictures in great light, always full views with a generous number of close-detail shots that are downloadable to your MY PICTURES file for further study & drooling. I know there are other places online besides the popular auction 'sites where antique crazyquilts can be found, but these ladies are the professionals whom I would trust with my virtual several thousand dollars [grinning helplessly], so I mention them today. We were discussing how it is possible to create a diagnostic Profile of any worthwhile crazyquilt block or full quilt [top]. The rationale is that, by understanding as many 19th- and early 20th-century CQs as we can, we'll be better able to continue to create above-average crazywork items in our own time. At least, this is one of my very personal theories. 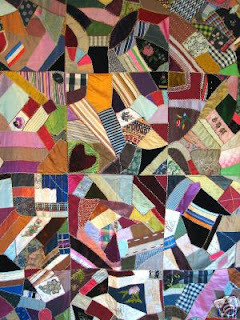 And most of what I believe so strongly is based on an often-encountered phenomenon: the preponderance of "sew-and-flip" crazyquilt piecing that we have all seen since the resurgence of this wonderful textile-arts medium in the mid-1980s. Sadly, there are too many people who believe that this is the only way to put together the patchwork for all of our crazy blocks and quilts. But it isn't. I say this, and at the same time I have to express my profound gratitude that Judith Baker Montano has taught the world this method of making crazyquilted things. 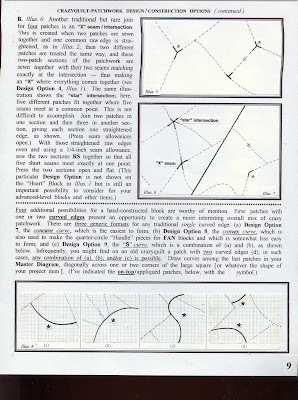 I showed this important technique to absolute beginners in the very early 1990s, and I've seen beautiful quilts and other items made in this 20th-century way. But I also have to be honest with you. 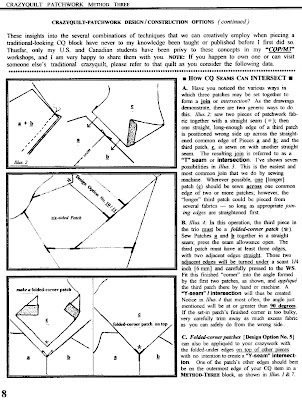 The two items that I attempted in this piecing format (1991) drove me a little crazy, figuratively speaking, even tho' Marianne Fons taught the guild-sponsored class I attended exactly how to deal with the increasingly-larger and larger patches that one has to add as one pieces the last "rounds" of patchwork. 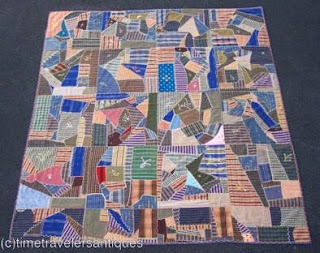 I just couldn't adapt, and I couldn't get around the fact that "sew-and-flipping" doesn't look anything like the authentic [there's that word again...] original crazy patchwork. I had fallen in love with the latter format those few years before, and I guess I got stuck in my preferences, but with wonderful results, thanks be to Heaven. "Essential Elements" of CQ-Patchwork Design & Construction -- list all that may apply here. Note: there are at least 22 different applications in the cloth that can be combined to create a sizable piece of crazy patchwork. I've mentioned nine of these so far and will soon tell you a little about the remaining thirteen piecing strategies. In the meantime, how many of these can you discover or think of? Hm-mmm? Most Interesting / Eye-catching / Important "Patchy Aspect" about this item -- list only one. I assume that I chose to document this item in the first place because something about it was special enough to intrigue me, even if I cannot find anything about it that is altogether unique. This is the only truly subjective finding for every CQ item. Fabrics used -- list as many as can be identified and your best guesses for some of the "mystery patches." Also answer these questions: (a) are most or all of the fabrics solid-colored? (b) Are all, most, several, or just a few of them prints? (c) Does one type of cloth dominate the CQ item (as, for instance, velvet/een, cotton, woolens, denim, polyester double-knits, or other fibers)? If not, specify "an assortment of fabrics" as making up the patchwork. Green, Blue-green, Blue, Blue-violet, Violet, Black, Gray, and White. 7. Contemporary or unique Embellishments -- those not listed in No. 3. 8. Other Non-traditional Applications. Does the item possess an odd shape? Is its size unusual -- either very small or very large? How is it backed? bordered? bound? 9. Workmanship. How would you grade the piece if you were a quilt-show judge? 10. Condition Overall. Specify any level from "MINT" to "POOR." Specify all damage noted to any portion of the item, just as if you were a professional appraiser of quilted items. (At least, do your best.) Note whatever is right or wrong with the piece as you found it. Last of all these points, if you wish, you might give the profiled/documented item a "star rating," based on whichever system you like best. This can be a lot of fun, especially if several friends have critiqued the same CQ item and get together to compare notes (literally speaking) over peach-tea-flavored Crystal Lite & Sun Chips or movie-theater popcorn. In my opinion, once again, there are very few "ten-star" crazyquilts from the dates that I'm most interested in, but I do have two favorites. One is the magnificent Tamar North Mourning Quilt in the collection of the Metropolitan Museum of Art, and the second is the famous, totally one-of-a-kind Barnyard Quilt dated 1920 and made by Mittie Agnew Barrier, I believe. The first of these may be found on the Museum's website; the other was first documented in Ms. McMorris's invaluable 1984 book, Crazy Quilts. These are two of my "ten-star" quilts, for they are absolutely perfect in every aspect to my artistic eye. If I can get permission to show them in a future bloggy post, I will do it in a heartbeat. This is your post for the day, dear hearts! Off I go at 0203 hours, central-daylight time, star date unavailable. Gonna go look for more exciting photos to add to this later on, but, to be very honest with you, thinking this hard has done wore me OUT! Yes. Be well, and let me know if any of these ideas might make a difference to you some day. 'Til next time. . . . .
G'day! So, I was saying to Miss Hortense Eileene earlier in the day, how should I proceed, d'ya think? Of course, she couldn't have cared less. Then I remembered that Blogger sent my last photo to the head of my last post instead of to the end of it -- which gave me the idea for today's scary subject. I say "scary" because, well, some things are easier than other things, and I because I've come to a point of confession after these few weeks as a Bloggeress. After twenty-one years in this groovy pursuit of great and humble crazyquilts, I have become exceedingly opinionated! As in, too sure of the correctness of certain approaches to gaining mastery of our subject matter (don't laugh, Miss Willa). OK -- that's a little too silly for even me. 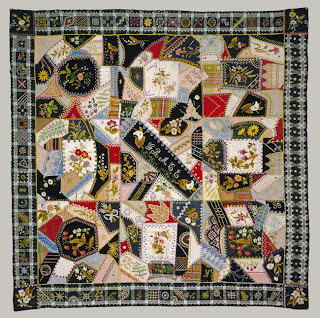 But I meant to say, I'm convinced that we can't learn the fundamentals of crazyquilt design and construction UNLESS WE STUDY ANTIQUE CRAZYQUILTS. Not everyone, not even every expert on the subject, would agree with me. That's the scary part. I have to say at this point that, with certain very reasonable exceptions, and giving total homage to all of you brilliant contemporary-mode crazywork creators among us, I am far more "19th-century" than I probably ought to be. That's why I study the old, pre-1950s CQs. No -- I mean, really study them. As in, spending at least an hour (and oftentimes much longer) with many a quilt or block that Life presents. With pencil or pen AND substantial note-taking book in hand. Just as if each one were a long-hidden-away textbook of some great significance -- because truly, that is how I view each one. All of the time that I'm looking, I'm aware that I could not possibly SEE everything the quilt/block/pillow/garment has to show me, at least not all at once. The best strategy for me is to apply a device that somewhat mimics a forensic investigation into one particular piece of evidence -- except, I do have my own time-tested procedures that have absolutely no resemblance to anything done in any CSI lab! 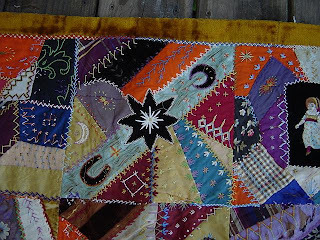 Before I post my "Reading Chart," there's one more thing to remember: to really understand whatever the CQ item has to teach us about authentic crazy patchwork, we have to look beneath the stitchery, the colors, and the fabrics. It's an acquired skill, and we get better and better at it as we do the exercises that are being suggested here. Perhaps I should also mention that I only invest the time it takes to "interview" any CQ item in depth IF that item is visually stunning to my eye; thus, anyone else wishing to study in this way will decide which items are worthy of her efforts to "get acquainted." More to come, and I hope you find it at least interesting, 'cause I will reveal the rest of the "How To Read" information next time! Comments in agreement or disagreement will be equally welcome along with any ideas which occur to you. OH: these photos (and the one from the last post) are all from the same 1880-to-1910 antique quilt. An eBay offering, I haven't been able to find its owner, and I hope I haven't violated a copyright by showing them to you. Each block has several important things to teach us, if we can only see them. . . . .
Blessings on the morrow, and affectionate back rubs to all. 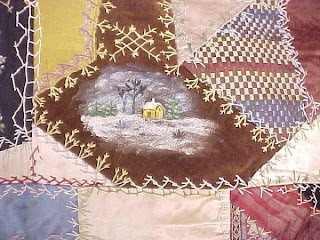 . . . .
regarding "CRAZYQUILT PATCHWORK / Method Three" (and why you might find it an interesting read). . .
Springtime in August gives me such a great sense of Hopefulness, ya know. More thanks-givings are coming your way as I recall the kind words about the recent Tutorials. I truly hope you won't think that this is just too much analytical overkill, 'cause these findings have helped me immeasurably. 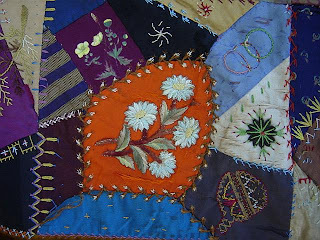 Mostly, my acquaintance with the "Twenty-two Essential Elements" has taught me to recognize and appreciate a really excellent (that is to say, well-planned and well-executed) antique crazyquilt whenever I have the pleasure of meeting one. 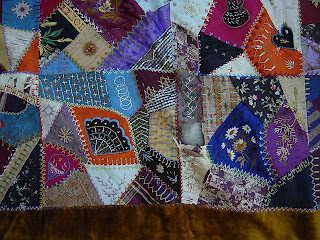 You know as well as I do: not every crazyquilt is created equal, as not every one of them is pleasing to the eye of the beholder. Well, I suppose there's something to be said for having too much information about almost any subject we can imagine. A lot of information is being offered to my Sisters of the Fancy Cloth, to be sure, but I'd so much rather think of it as insight instead of just an abundance of simple and complicated facts. If the subject intrigues you even a little bit, please come along for a sometimes exciting, sometimes startling journey into the Wonderful World of Crazy-Patchwork Design and Construction -- which, as you must know, is the primary "umbrella topic" for everything we've been discussing since last Friday. OK! The Introduction to the Workbook gives the historic data that explains where the fundamental, altogether essential idea for "...Method Three" originally came from. My favorite disclaimer is about to be uttered again, so be warned: "Not everyone needs to know this, but. 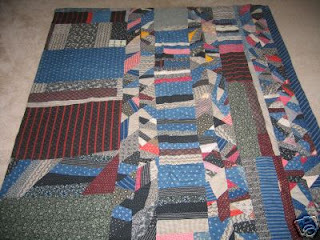 . ." if you are like me, crazy piecing -- no, successful, decent-looking crazy piecing -- is very difficult. I'm not sure that even Martha Green's extraordinary piecing method would be easy enough for me at this stage, and many people swear by it! So what's a crazyquilt-loving, extremely OC/perfectionistic/left-brained eldermom to do when her focus takes off for an extended vacation and doesn't tell her where it's going? The answer came in one of those "duh!" moments we can all relate to: in five words, I thought, why not use freezer paper? Oh, I know; nothin's that easy -- or is it? Well, almost! Actually, "Method Three" is my sort of updated manner of constructing crazy patchwork by using pattern pieces, not unlike Ms. Michler's technique as described on page 26 of her very important book, The Magic of Crazy Quilting / Second Edition. The difference is, instead of making my Pattern on typing or drawing or graphed paper or even on a high-quality tissue paper, I use Reynolds brand white, poly-coated, temporarily-fusible freezer paper. I pre-design all of my CQ blocks nowadays, being sure to include a mix of the "Essential Elements" among the patches, and so on until I have individual pattern pieces that will be pressed onto the wrong sides of my various block-making fabrics. There's quite a bit more to know, however, and that's why I wrote the current Workbook. Thirty days more should be enough time to finish the remaining illustrations and "fiddling" with page numbers and captions and photographs for the front cover. Of course, I don't expect this little overdue publication to create a major stir in CrazyLand, especially when "Method Three" is so untraditional AND is almost too "sane" for most serious CQers. But for some of us. . . I found another wonderful antique block for you to study, if you wish to. Will try to coax Blogger to let me put it here, where it belongs. Everyone, con-cen-trate. . . . .
Hi, again! Guess what. I never thought that posting the previous article would cause me to work so hard, revising and fretting over the Workbook that the ideas are taken from. True to form, I've been trying to finish this 60-page tutorial since 2002, when I got really serious about gettin' 'r done, and when it only had about 32 pages of text & pixures. Well, phooey on that plan! Anyway, let's hope the three scans will appear somewhere in this post, 'cause (speaking ve-e-ery quietly so Blogger won't hear) I really need FOR BLOGGER TO HUMOR ME TODAY! Nice to get that out of my system. . .
Four: Illus. 6 on one of the drawings, below, shows one of my favorite decorative constructs -- a "star" intersection. I hope you notice that there are five patches whose seams come together at one point on the block, altho' there might even be six. A "star" can be created in the easy manner described in the text that accompanies the illustration, or you can simply sew five patches together in a clockwise or counter-clockwise [anti-clockwise] direction until all five seams are done. Since everything has to lie flat eventually (if you're working in the traditional mode), a "star" might best be pre-designed on paper, with templates cut out and used, etc. * By the way, this "Essential Element" is also known as Design Option No. 18. We've gotten thru the standard seam intersections, so we can elaborate just a little more on. . . .
Five: . . . folded-corner patches. This time there's no pre-cut angle to have to fit the third patch into; in fact, folded-corner patches, for want of a more descriptive term, are not "third patches" at all. They are those appliqued pieces of cloth that are constructed with at least one angular point -- or corner -- which does not necessarily intersect with one or more of the block's seams (altho' it can, if we want it to do so). As difficult as this is to say in words, all of us have seen dozens of antique crazyquilts with this particular Element present among (and upon) the sequentially-joined patches. So, looking at the scanned drawing of the Heart-shaped block, note the patch numbered 5 with two asterisks, one at the corner and one more or less centered near one edge of that patch. The first asterisk simply defines the folded corner, and the other asterisk tells you to be certain to applique this edge on top of the pertinent raw edge of Patch No. 1. The neat thing is, we can start out with a piece of cloth in an appropriate size, and as long as it has at least three edges to make a patch, we can turn under all of its edges to the wrong side and press them into a pleasing shape to be used late in the patchwork process, OR we can place the patch as I did in the drawing, with one edge underneath Patch No. 7, one [upper] edge under Patch No. 9, and one edge helping to form the finished containment line for the left edge of the block. Only the folded corner's two adjacent edges need to have their seam allowances turned to the wrong side for a pressing; the other three edges remain flat. +++ But wait: . . .
Six: . . . if you will please find Patch No. 6 in the Heart's upper right "chamber," you'll notice a nifty variation on the patch with one folded corner -- a thing I can only refer to as a double folded-corner patch. Betcha I doesn't has to tell anyone how to create one o' these, huh? What? It is true: you can't make your blocks in sew-'n'-flip mode and make a block such as the one I designed for this exercise, BUT, any block of crazywork can be improved and made more traditional in appearance by the addition of either form of folded-corner patch. I recommend that you give it a try! Don'tcha just love it when even very important facts have numerical limits?, freeing you to NOT have to memorize how many -- oh, dear. I digress again. Here's the next Very Important Fact of Crazyquilt-Block Design & Construction: there are only THREE different kinds of CURVES employed in crazywork! How cool is THAT! 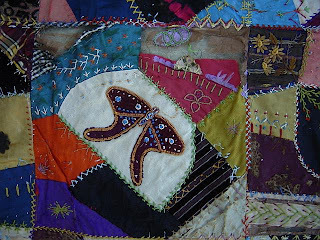 * The 60-page Workbook I've been working on for so long is titled CRAZYQUILT PATCHWORK / Method Three. "Method Three ROCKS!!" It's all about crazy blocks & garments & tea cozies & whatever else you might have in mind one day -- only, I need approx. thirty days more to finish the wretched illustrations. Will give ya more specs. in the next post; also a few "inspirationals" from within its oft-revised pages. Meanwhile, enjoy the possibilities just presented, and know that I forever appreciate the kindness and enthusiasm shown in your messages to me since three Mondays ago. Gonna go get pixures now! Hope you'll spend another fifteen minits or so with me in a few days. . . . .
for serious CQers: the 22 "essential elements". . .
"It's a beau-ti-ful day in the neigh-bor-hood..." Did you love Mr.Rogers as much as I did? What a great man, in the old-fashioned sense of the word, my favorite famous person since Roy and Dale (and James Doohan as "Mr. Scott"). I'm afraid I'm tearing up as I remember him today. HOW'S EVERYBODY DOING? +++ I have to apologize again for the glitch re: the Teddy Bear scans. To my dismay, even though the pixures belong to two of Blogger's acceptable file formats, they were way over the 8-MB size maximum, and that's why three days'-worth of trying wouldn't do the job. All of a sudden, Miss Willa came to my rescue (again!) and helped me to understand what to do -- altho' the images still do NOT end up anywhere near the spot I want to place them. If I can just learn that one thing -- oh, and how to move photos when they upload themselves into an illogical place, I'll be one happy eldergal!! +++ So, why don't I just go slightly backwards and talk about those marvelous "Twenty-two Essentials"? Why don't I just go and find you some photos that will illustrate exactly what I discovered after a decade or two of looking at crazyquilt blocks, hm-mmm? OK. Question: when you look at a CQ block, what do you see besides the colors, the various fabrics that were used to create it, and the stitchery designs/embellishments? Are you able to see the structure of the patchwork that is "beneath" these decorative aspects of the block or other CQ'd item? It took years for me to develop this skill, but I can really do that fairly quickly now, and I can recognize all of the Essential Elements that any block might contain. While this is probably not very important to most of my readers, I had to know what the crazyquilt makers of 125 years ago were doing. I'd chat with my inner Victorian spinster, affectionately dubbed "Miss Hortense Eileene," a marvelous (and highly competitive) needlewoman, don'tcha know, and would ask her what was what; but she was never very helpful. Still, the answers came, and it's time I passed this "optional information" on to you -- starting with this next rather important observation. Here goes! One: There are only two generic ways to piece THREE patches together, plus three special variations which require some form of applique. The first process is the most common of ALL the joining methods. "Two of your patches are sewn together along the two edges that are meant to be joined, creating the first seam. One of the long [common] edges of this two-piece construction is straightened by scissors, and a third patch with at least one edge that's long enough and straight enough to be used for this purpose, is sewn -- right sides together -- across the straightened edge of the two-patch assembly to create the second seam." That's a very long-winded way to describe most of what happens in order to join three patches together when piecing a crazyquilt item. (If we were strip-piecing, there'd be a different operation to talk about.) This resulting join is referred to as a "T" seam or "T" intersection. 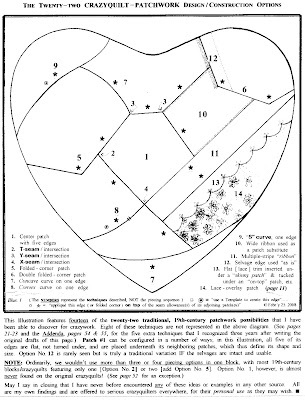 The Heart-shaped block, above, is entirely made of these joins with one exception. Note, however, that I didn't say anything about the angles in which the two seams will intersect, nor did I tell you about the Advanced Version of creating a "T" seam. . .
Two: Not all of the intersections among three patches form a recognizable "T" of some variation. Our second option is more involved, but the finished results are more interesting. "Two pieces of cloth are sewn together with a straight seam; press the seam allowance open. Instead of cutting the common edge of the first two patches to create a completely straight edge that is perpendicular to the seam just sewn, each patch will be designed in such a way that, in order to fit the third patch in place, the third patch will have to be pre-constructed. Illus. 4 shows the two adjacent raw edges of the third patch (c.) turned to the wrong side and pressed. I gave a name to this type of piece and call it a folded-corner patch. That prepared corner will be played with until it fits into the angle made by the first and second patches in the assembly, and then it [the third patch] will be appliqued in its place to cover the two appropriate raw edges of Patches a and b (which you may have to straighten a bit individually). The resulting join is referred to -- even in "sane" quilting circles -- as a "Y" seam or "Y" intersection." I have seen such a three-patch assembly on an antique crazyquilt in which the first seam, between pieces a and b, was a curve, but I've never seen a curved edge on the third patch on either side of the folded corner. It wouldn't be impossible to accomplish, but it would be pretty difficult to do this well. It's just turned to 0200 hours my time, and there's so much that remains to tell you -- about a dozen posts'-worth of info & discoveries on this subject. Hope you're still dropping by for occasional visits. Be well, dear Ladies. . .